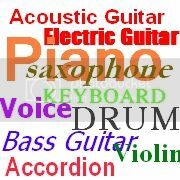 Learn to Play Guitar (Electric, Acoustic) or Piano (Keyboard) at Home. "The pace of scientific research into music making has never been greater. New data about music’s relationship to brainpower, wellness and other phenomena is changing the way we perceive mankind’s oldest art form, and it’s having a real-world effect on decisions about educational priorities."